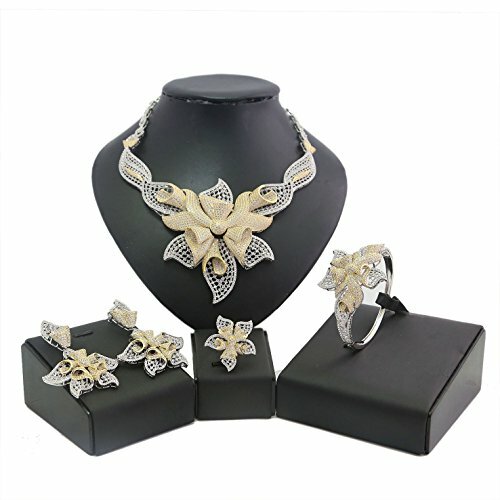 Our women's fashion jewelry collections are made with very good quality copper. "Heart and Arrows"zircon,Exquisitely exclusive design allows its wearer to stand out with their refined fashion sense and be worn with any kind of attire be it classy or casual. Ideal accessory gift for women of all ages,especially for Nigerians and African.Made with environment friendly materials for our sensitive customers. The main meterial is eco-friendly copper,free lead or nickle.Harmless for Children and Pregnant women. Including 2 necklace,1 pair of earring,1 ring,a bangle..
A gorgeous presentation as a gift for her - your mother, daughter, wife, fiancee, sister, girlfriend and bridesmaid for Christmas, Valentine's Day, Mother's Day, birthdays, weddings and graduations. If you have any questions about this product by Yulaili, contact us by completing and submitting the form below. If you are looking for a specif part number, please include it with your message.